We have a 24 foot round outback pool. We just bought the home and the pool water was horrible due to no maintenance for 600 days. So after 9 days and several hundred dollars in chemicals, etc, my wife and I decided to drain the pool. We got the pool drained completely. The pool is above ground, but on the one end is about a foot and a half into the ground (to level it) and there is a deck on that end. When we started to fill it, we noticed 3 panels under the deck pushed in due to mud sliding into it. Two of the panels I dug all the mud back and they are still in the track and look ok. One panel was pushed in off the track. We tried very hard to get it back in the track but cannot. Right now it is partially on the inside of the track and partially on the outside of the track, just on this one panel, and it is krinkled if you know what I mean. I called one pool place and they said I need to dismantle the deck and dig back 2 feet from all 3 panels so they can re-level the posts and track and straighten the one panel. They charged me $75 for the consult and will be back when I get the hard labor done. the track, back fill and fill the pool and the water will push the panel against the track and the earth will hold it. So don't worry about it not being in the track. My question is, what should I do? What if the part of the panel that is outside the track won't stay on the inside of the track? Is this safe to do? What do you recommend? Hi Steve. 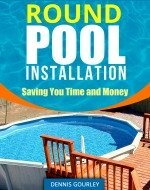 Your biggest concern right now is your liner shrinking and not allowing you to refill the pool. The wall out of the track really is not a concern at all. As the pool fills you should be putting dirt back in around the pool and that will hold the wall in place just fine. It should not make any difference whether the wall is inside the track or outside. As the pool begins to fill you should push your foot to the edge of the pool in that area and make sure the cove has not been disturbed. It can probably be packed back into place with your foot, through the liner, but is should be checked. Vinyl liners shrink whenever they are drained so the liner is going to have to stretch back into place in order for the pool to fill without pulling the walls down or pulling out of the coping holding it in place. To have the best chance of this pool filling up without a problem you should start the hose running during the hottest part of the day, hopefully when the whole pool is in direct sunlight. Hi There! Thank you so much for your comments and suggestions. One thing we did do right by accident was started filling the pool right away. The time we were working on the sides, we always had 4-5inches of water in the pool. I think this probably saved our liner. The cove, as far as I can tell is ok. When my wife was trying to push on the wall, she could feel the bottom cove around the bottom of the panel so I know it is still there. Right now I am filling the pool and it is about 8 inches of water and going. I am planning on backfilling more and more as the pool fills. I sincerely appreciate your advice. I am glad I checked into this. As the one pool guy wanted me to dismantle the deck and dig a 1.5 to 2 foot trench around that end of the pool before they would come in and relevel and reset everything. Probably would of costed me $600 or so dollars and a lot of labor on my wife and I. I am surprised that he didn't suggest that the earth would be the best backing and just back fill. In any case, with the cost as high as it was going to be, and the fact that the deck wasn't coming apart to easy, it would of been a nightmare and funds we don't have. So your advice is a lifesaver. So I am assuming that once the 1 1/2 feet of backfill is full, this will more then support that wall? Thanks, and yes, the dirt will support the wall just fine. How do you know if your liner has shrunk? We had it completely empty probably for a good 4-5 hours then started refilling. Everything looks ok, the only think I did notice is that the bottom of the liner is a different pattern then the sides, and on the one side the side patter is pulled more towards the center of the pool then the other side, maybe by a foot or so. But I am not sure if that was like that before because the water was so dirty we couldn't see it. ??? Hi. If the liner is up against the edge of the pool all the way around you are fine. It sounds to me, from what you have said, that you have plenty enough water in the pool that shrinkage should not be a problem. The liner was probably just set off center when it was installed. Normally the liner will shrink pretty evenly all the way around, not pull to one side. I would keep filling it and watching it. Ok, Pool is completely full. No leaks or tears at all. Everything seems fine. 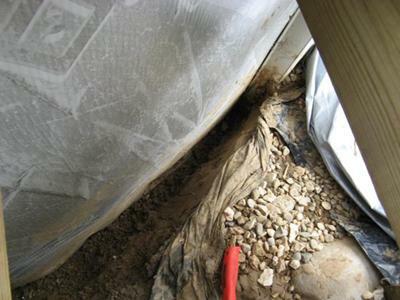 The only issue I ran acress is that on the side where the wall pushed in, there is a couple rocks under the liner. I can feel them with my feet. I probably could cause a tear if I pushed hard on these rocks, they are small but pointier edges. I guess at this point is wait and see if there is any issues. If they did puncture through at some point, how do you know there is a leak? I could just patch them if there is an issue I guess? Thank so much! Hi Steve, I am sure we both agree it is not worth draining the pool, pulling the liner back, and removing the rocks. The pool is full and I would leave it that way. You could, however, go underwater with a rubber mallet and tap the rocks down flat. You could then apply a small patch over the area and be done with it. I like using the underwater Boxer glue with a small round piece of actual vinyl as the patch. A properly applied patch will last as long as the liner. We have a 12x18 pole pool. We just replaced the liner and began filling the pool. We noticed that a small section...about 2 feet...is not on the bottom track. The pool is entirely above ground. Will the pressure of the water hold the section in place or do we need to drain and fix this? We would greatly appreciate a response...thanks. Hi. I would say fix it, the water will only make it worse. Hi. I live in PA and with all the snow and rain our pool wall was pushed in from the river rocks we had around pool. Most pool guys won't install my new liner since they said it will collapse. I was told to dig 2 ft across and 4 ft down and put wall back on track. The walls are bowed in. Does this sound right? Do I just lift and put back? Hi When you say 2' across and 4' down I can only assume you have an above the ground pool set in the ground. If that is the case I agree with the installers. In order to install the liner some movement is exerted on the sidewall. This movement could easily cause the walls to collapse. Anytime I am putting a liner into a pool that is in the ground and has river rock around it I at least spend an hour or so and pull back all the rock. Once that stuff starts to get in between the wall and the dirt it just causes major problems.